In their search for original solutions for decorating walls and ceilings in a residential area, some opt for decorative panels. Such a material can serve as an element of decor, and the main finish. 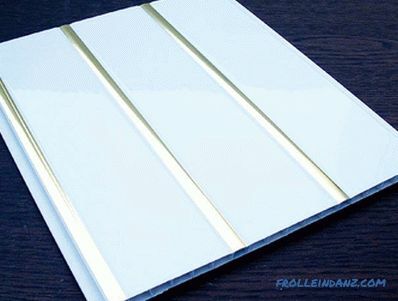 There are many types of decorative panels, which in most cases are characterized by high moisture resistance, heat resistance and sound insulation. If you have not yet decided on a choice, then it is worth finding out some advantages of this wall covering technology. Decorative panels for interior walls perfectly hide all the bumps. This allows you to save when carrying out finishing works, namely on the alignment of the walls with plaster mixtures. This article will look at various options for decorative panels, which can be installed in the kitchen, bathroom, hallway, and even the living room. Wall cladding panels, unlike other finishing materials, have many advantages. For their installation there is no need to level the base. In a short period of time it is possible to process a large area of ​​the wall. In the market they are represented by many different shapes, sizes, textures and colors. Thanks to this, you can choose exactly those panels that best fit the chosen style of the room. Rack. Their fastening is carried out using special brackets. The width of the product can vary between 13.5-30 cm, length 0.9-3 m, and panel thickness 8-12 mm. Tiled . The shape of the tile panel is square. The standard tile sizes are 30 * 30 and 90 * 90 cm. Sheet . It resembles sheet plywood, on top of which drawing is applied. The thickness of such a panel ranges from 3 to 6 mm, and the dimensions are 1.22 * 2.44 m.
Quick and easy installation. When fixing wall panels there is no need to carry out preliminary preparation of the walls. For their installation it is enough to have nails, glue, wooden bars, a stapler and other fastening material. Versatility. In addition to the decorative role, they can serve as heat insulation and sound insulation. Easy to clean. It is enough from time to time to wipe the surface of the decorative panels with a damp cloth. Savings. In contrast to the use of other finishing materials, wall cladding panels - economical option. Design solutions. 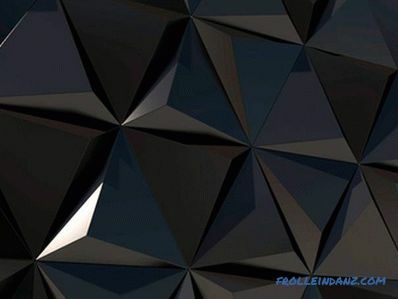 Decorative panels can be glued in different directions, for example, vertically, horizontally, diagonally, and even a diamond. Durability. The surface of the panels is resistant to mechanical stress. 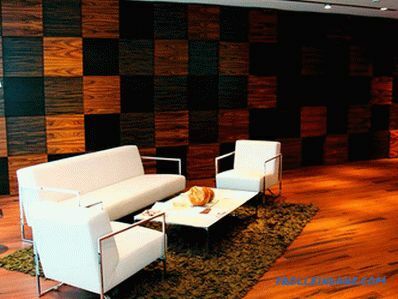 Decorative panels for facing solid wood walls are one of the popular finishes. Although there are many alternatives, this material does not lose demand. This is explained by the fact that it is environmentally friendly, and the texture of the tree conveys a special mood to others. Moreover, no material can successfully imitate the structure of wood. They can be installed in almost any room: residential apartment, living room, restaurant, office. Plus, their installation is quite simple. Varnishing. Varnish allows wood to become more moisture resistant and have a more attractive appearance. Lamination. The surface of the wood is glossy, plus to this, it acquires additional protective properties. Veneering. The veneer of valuable breeds of natural wood is applied on the tree. Such panels have a beautiful appearance. 1st method - groove-comb. In this case, a tight docking of all elements is provided. Also, this connection method allows you to create a single picture. 2nd method - groove-groove. With this method of docking, the colors and jointing will not match. Additionally wooden decorative panels are decorated with baseboards, slats and fillets. For the manufacture of such panels, wood of such tree species is used: pine, cherry, beech, ash, spruce, cedar, alder, oak, maple. Each wood has its own unique texture. You can combine several types of wood in one panel, overlaying it in layers. 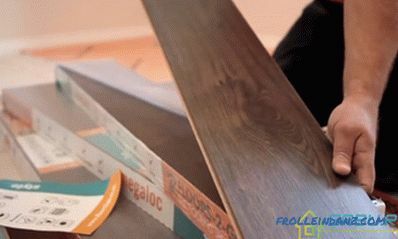 For this, there is a special technique where layers of different wood types are securely fastened under high temperature and pressure. 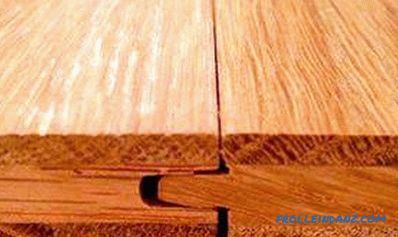 Multi-layer wooden panel is the most common . The top layer is made of expensive wood veneer, and the middle layer is made of less valuable wood. In appearance, they completely resemble solid wood. The glued panel. Coniferous trees are used. With success copes with the damp atmosphere. There is no formation of fungi and mold. Glued veneer panel. The product consists of several layers of thin veneer, which are glued together. To give the workpiece high strength, the layers are glued perpendicular to each other. Unlike a solid array, the cost of a glued panel is much lower. Most often, such a panel is used to finish the ceiling surface. Veneered from chipboard. The top layer is made of natural veneer, and the inner one is based on chipboard. The blanks are heavy, so they are rarely used. Solid array. This is the most expensive material for decorative walls. Drawing and texture match the selected wood species. Possibility to hide certain communications. After a while, you can repaint. Low level of moisture resistance. High cost of decorative panel. 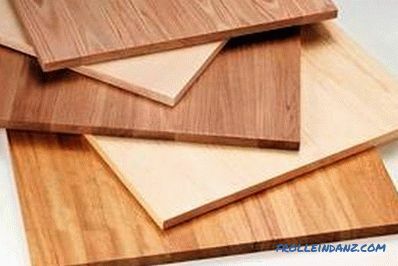 Material Chipboard and MDF differ in production technology. Unlike chipboard, MDF decorative panels are much better. 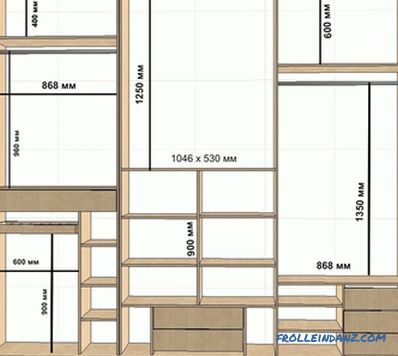 This is explained by the use of high-quality binders in the production of MDF. 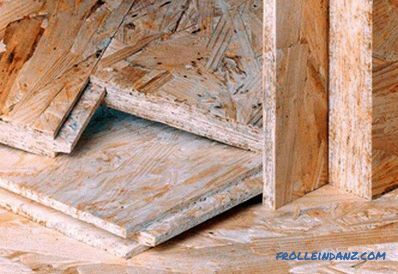 Chipboard uses harmful binder resins urea formaldehyde and phenol formaldehyde. Even in small quantities, they can adversely affect the human body. MDF panels, in turn, are made of natural materials. As MDF and DSP are covered special water repellents. However, as a result of prolonged exposure to moisture, these materials begin to deteriorate. The only difference is that particleboard swells and deforms faster than MDF. Chipboard surface is uneven and porous. Therefore, for its painting, it is necessary to pre-process it, clean it and pierce it. As for MDF panels, their surface already has a special coating, so they are ready for painting and other processing immediately. 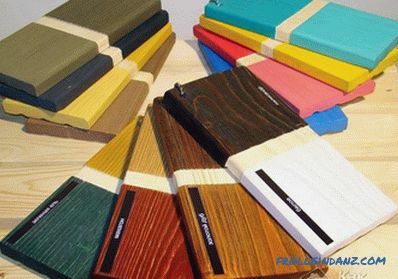 MDF panels are obtained due to the method of dry pressing of sawdust. At the same time the material is processed under high pressure and temperature. To make the material very high quality and resistant to wear, carbamide resins are added to it. Do not require special care during operation. Before installation, there is no need to make serious surface preparation.The condition of the walls does not affect the quality of the finish. Ability to mount panels in any direction: diagonal, across or along the wall. After installation works, the sub-panel space can be used for laying communications, for example, electrical wires, the Internet and others. They differ in the method of production, technical characteristics and decorative properties. For example, solid pressed plates have a smooth surface on both sides. 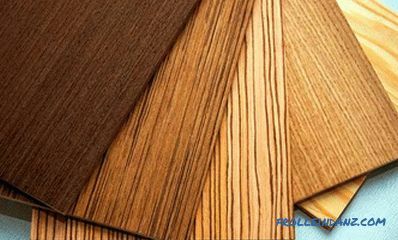 Laminated are characterized by the fact that the front surface is covered with a thin polymer film. Due to this, the resistance to mechanical stress, moisture, etc., increases. In this film can have a variety of colors and design. As for moisture-resistant MDF panels, their production is carried out from a more dense material. The basis are high-quality wood. 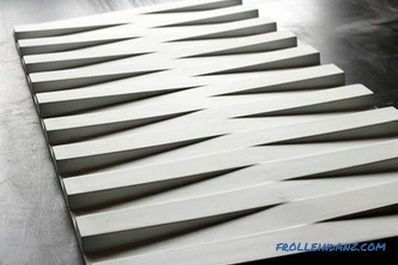 As a result, such panels are used for finishing baths, loggias, balconies and other rooms with a high level of humidity. Painted . The rough surface is treated with a special paint, which smoothes all irregularities and gives the product a glossy or matte appearance. Glossy . The front side of the product is laminated with a transparent polymer film. Veneered . Possess the texture of real wood. This effect is achieved by laying a thin veneer made of wood with a thickness of up to 3 mm on the MDF surface. You can use ash, oak and other tree species. Low sound and thermal insulation. Matte surface . The design is applied under a natural stone, wood texture or textile. Glossy surface . Design is applied under the imitation of wood, stone, tile, marble and even vegetable patterns. As the coating can be used a special finish film, varnished. It is scratch and abrasion resistant. Panels are connected using thorn-groove technology, and fixed to the crate with nails. This finish will support the weight of hanging accessories, shelves and other products. Product dimensions vary within the following limits: thickness 12 mm, width 12.5-30 cm, length 2.4-3.7 m.
They are attached to the wall on a slatted frame with nails, self-tapping screws or using special glue. The dimensions of the decorative panel are in the range from 300 * 300 to 980 * 980 mm. They are glued to the wall with special glue or screwed on the frame with screws. 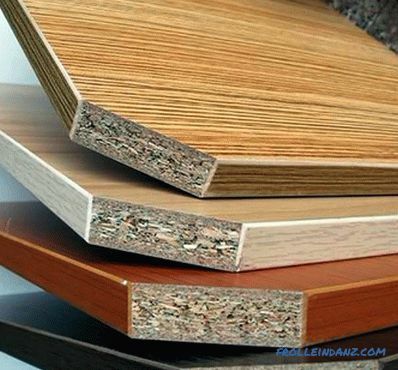 The thickness of the decorative sheet panel of chipboard is 6-8 mm, length - 1.22-2.44 m. In addition, the panels are finished with profiles, cornices, decorative corners and the like. It is mainly used for arranging a kitchen apron. In its production, a moisture resistant board with a finishing coating of 6 to 12 mm is used. Given the peculiarity of the coating, the holes for outlets and other communications should be made very carefully. Е1. 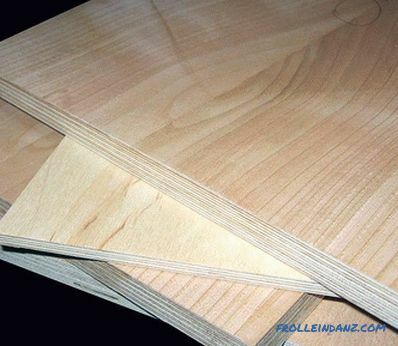 Such plates contain at least 10 g of free formaldehyde per 100 g of dry chipboard. Such indicators are allowed for the production of furniture in the nursery. Y2. In such a material can be on 100 g of dry chipboard from 10 to 30 mg of free formaldehyde. In this case, the use of such plates for the production of furniture is prohibited. Super E. The stove of this classification is ultra-safe. They are recommended to be used for decoration of residential premises, children's rooms and in the production of furniture. Perfectly cope with mechanical stress and withstand abrasion. Based on such technical characteristics, they are mounted on the balcony, toilet and in the corridor. The presence of a polymer film on the panel allows for wet cleaning, even using detergents with chlorine. Under the influence of ultraviolet rays the color of the panels does not change. Therefore, after a while, the fiberboard panels will remain unchanged. Based on the design idea, decorative fiberboard panels can have a different coating: gloss, matte and textured. Visually, such panels are no different from hard ones. The difference in the methods of their production, as well as in technical characteristics. Their production is carried out exclusively from coniferous wood. Lignin, a special polymer composition, is used as a binder. This substance is extracted from the juice of resinous wood. Such panels are considered environmentally friendly. 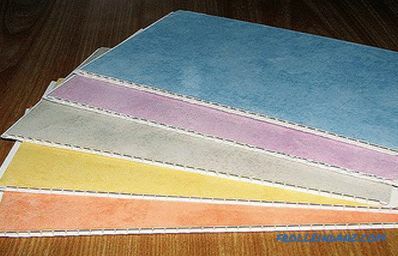 Although this type of fiberboard is soft, it has excellent thermal and sound insulation properties. 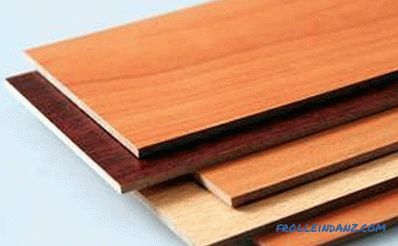 Panel thickness of 12 mm is equal to a wooden board of 450 mm. A layer of natural reed or linseed. 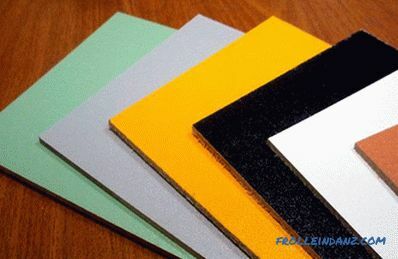 There is a great opportunity to choose any color, imitation and design of decorative fiberboard panels. For fixing to the wall - special glue. To the wooden crate - with staples and small studs. 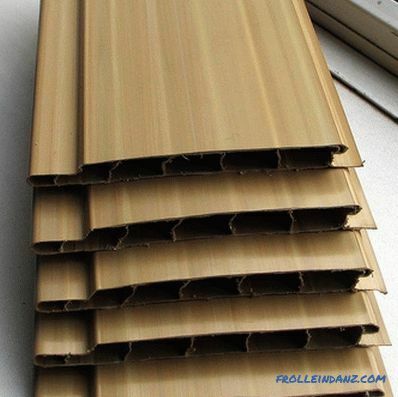 PVC decorative panels are the most practical and in demand. 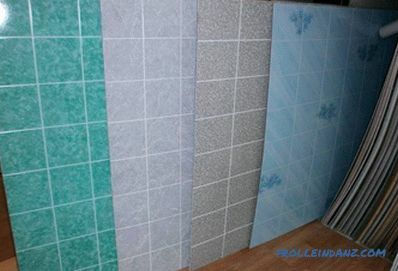 This material is used for facing the walls of the bathroom, verandas, saunas, balconies and other rooms. The composition of this panel includes a polymer of vinyl chloride. Due to this, the material is resistant to chemical influences, such as solvents, acids, alkalis, mineral oils. Narrow elongated lining. 3 m long, from 30 to 60 cm wide. 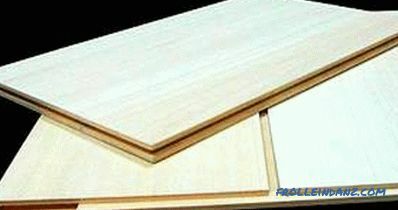 Square PVC panel. The size of the sides can reach 100 * 100 cm. When purchasing PVC panels, be sure to pay attention to their appearance. The drawing must not be damaged, and the panels themselves must be whole without any chips. 1 method : on glue. 2 method : on screws or nails. 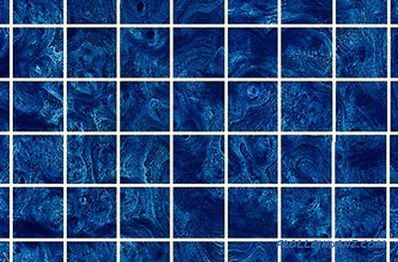 As for the first technique, it is mainly used for mosaic PVC panels. Plus, this method of installation is considered the fastest and cheapest. In all other cases it is necessary to construct a metal or wooden frame. If a room with high humidity, wood should be treated with special compounds, however, it is recommended to assemble the metal frame. The thickness of such a panel is about 1 mm. 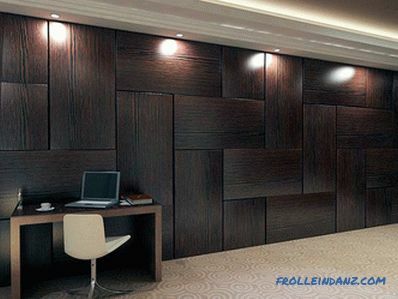 If there are columns in the interior of the room, then such bending panels will easily give them a finished look. They are used for finishing the ceiling, walls and work surfaces. Having a chamfer or rust. Seamless PVC panels are ideal for ceiling decoration. Due to the special joint, the joint is almost imperceptible. With a chamfer resemble the method of connecting seamless panels. However, in the end part is chamfer. By rust is meant a decorative hollow. They are used to finish the ceiling / walls. Mainly for walls, relief panels are used. In appearance, they resemble lining the cost of relief lining is much higher. 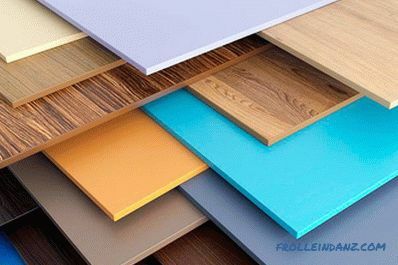 It is believed that high-quality PVC panels should be at least 10 mm thick. It is known that that panel, which has a large thickness, is able to withstand a large load. If we are talking about finishing the ceiling, the thickness may be slightly less than 10 mm. This indicator determines the ability of the panel to withstand a certain load. For example, it can prevent pushing, withstand mechanical stress, shock, and so on. Pay attention to the fact that if stiffening ribs are visible on the panel through the front side, this indicates its low quality. Therefore, it is not recommended to install it on the ceiling and, especially on the walls. However, many may be tempted by its low cost. It's simple: the more will have a panel of ribs, the better quality it is. This also affects the resistance of the product to mechanical stress. There should be no more than 10 between the stiffeners in the panel mm If the distance is large, the risk of dent formation is very large. Accordingly, after installing such a panel, all dents will be clearly visible. 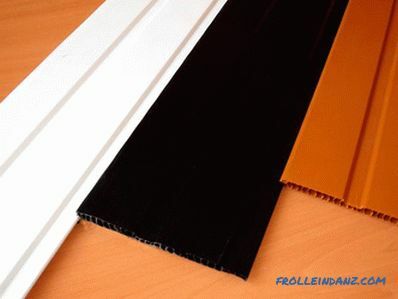 Special attention is paid to the method and quality of PVC panel dyeing. Some manufacturers do not add one or another pigment of color to the polymer mass. As a result, this can lead to the formation of scratches, which will be very visible. In addition, under the influence of ultraviolet rays, the color of the panel will fade. Installation of PVC panels in a residential area requires compliance with safety regulations. Therefore, before buying, ask the seller to provide you with a certificate of quality. Some manufacturers use toxic substances in their production, which can adversely affect their health. It is worth noting that when unpacking the panel may have a specific smell. But if such a smell has a panel that has been used as a sample for some time - be careful! The greater the number of stiffeners and the thickness of the front side, the more weight the PVC panel will have. If we talk about the standard weight, it fluctuates around 1.5 kg / m 2 . However, this is a conditional indicator, since much depends on the size and type of decorative panel. Be sure to make sure that the connection method used in your chosen panel is reliable and qualitative. Quality panels should contain no more than 20% chalk. The higher the number, the greater the fragility of the material. Therefore, some unscrupulous manufacturers in order to save add this component more than necessary. Checking the chalk content of a plastic panel is easy. Bend the corner of the panel slightly. If a crack or white strip appears, the amount of chalk exceeds the standard. If the panel is plastic, then you can buy it. Try to give preference to proven manufacturers who have proven themselves on the positive side. Reviews in forums about this or that material will help you. Gypsum decorative panels replace the gypsum stucco molding. Moreover, they completely replaced the stucco, as a similar method of finishing the surface is suitable exclusively for the classical design. The use of this material allows you to create grooved surfaces, giving a particular room a beautiful appearance. Easy installation . Gypsum is easily fixed to both horizontal and vertical surfaces. During production, strict geometry of all parts is observed, thanks to which the result will please the eyes of aesthetes. Long operational life . Gypsum itself is resistant to all kinds of mechanical and other types of effects. Moreover, gypsum panels easily cope with a small amount of moisture trapped on them. They easily cope with sudden temperature changes. Low weight . In the production of gypsum panels used lightweight gypsum. As a result, the installation process has no additional complications. In addition, walls or other surfaces do not experience additional stress. Environmental friendliness . The manufacture of gypsum panels completely eliminates the use of harmful substances. Therefore, this facing material is suitable for residential premises, including a children's room. High level of sound insulation . The extraneous noises of the neighbors or from the street will not disturb you. Efficiency . This material can imitate quite expensive counterparts, such as wood, stone, brick, and so on. Heat Saving . The available heat inside the room will be better kept if the walls are lined with gypsum panels. Moreover, if the walls are thin, the use of this material improves the quality of the insulation, and a pleasant microclimate will be created inside the room. Low flammability . There are no flammable elements in the composition of gypsum panels. Therefore, their use is safe. Due to the presence of modern equipment, today it is possible to produce gypsum panels of various shapes, designs and sizes. For example, known oval, round, square, rectangular and other panels. Depending on the type of gypsum board, they may have different sizes. For example, the size of square panels can vary in such limits 0.2 * 0.2 m - 0.9 * 0.6 m. The thickness of such elements also varies from 18 to 36 mm. One of The main advantages of gypsum panels are the possibility of repeated staining. 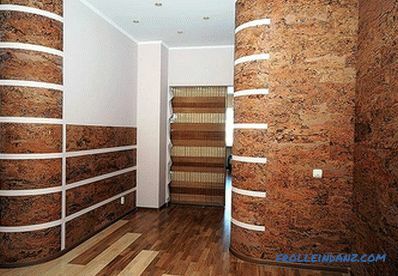 Therefore, if the walls in your room are finished with gypsum panels, after a while, you can easily change their color. Cork decorative panels are lightweight and durable material that is made from cork oak bark. In appearance, the material is presented in the form of a dense pressed mass having two polished surfaces. If the cork collapses, it does not immediately return to its original appearance. Sustainability. Cork has the ability to delay harmful radiation. If during use in a traffic jam dents are formed, they are not repaired. Hygienic.The special structure of the finished cork does not contribute to the accumulation of dust, moisture and dirt in its structure. It does not have high thermal insulation properties. This parameter can be compared with a wall carpet. Only glued cork tiles cannot be moved. Therefore, everything must be done ultra-precise. It can break if handled carelessly. Eliminates the formation of mold, and the cork itself does not rot. Resistant to UV rays. After a while, does not change its color. In the kitchen and other rooms. Although its cost is high, it fully justifies itself, since such wall decoration will last for many years. Leafy. May have the shape of a square and a rectangle. As for the sheet, they are of two types: typesetting and tiled. 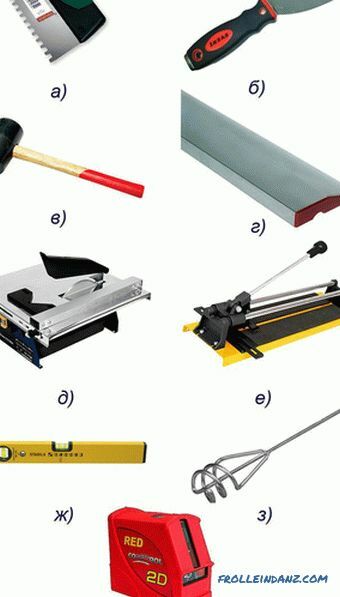 In the case of typesetters, they have a width of 100 mm, length up to 6 meters. Tiled also have different sizes from 300 * 300 mm and up to 980 * 490 mm. Given this diversity, you can create a variety of elements of interior design that will please your eye. Also, cork panels have a different classification by use. For example, they can be used to finish the floor, walls. There are insulating panels of sinter. 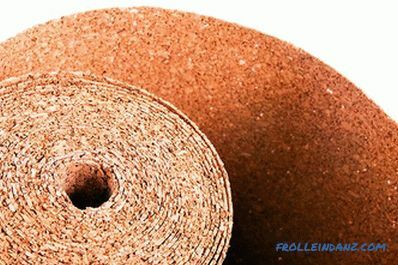 In order to increase the sound insulation properties of the cork is used as a technical coating. Some cork panels are made waterproof. They are faced with a double-sided laminated coating based on PVC, fiberboard, MDF. On the basis of chipboard cork panels are not moisture resistant. 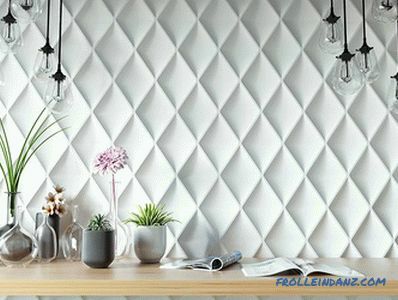 Today, 3D wall panels are widely used for quick and effective wall decoration. Thanks to this, you can create a variety of scenes, combinations and so on. You can combine the decoration with furniture or other elements of the interior. There is no need to create a perfectly flat wall surface. Minor flaws will not spoil the overall appearance of the finish. There is a mounting technology on the frame. In this case, it is enough to produce a rough finish, and then install and fix the frame. During operation of the 3D panel can be washed with ordinary household appliances. If wood or gypsum was used as a material, they will need more thorough care. You can use 3D to create decorative panels natural materials. For example, bamboo or other types of panels look beautiful. Fastening to the surface of a 3D wall panels increases sound insulation properties. If you build a frame and lay insulation in the space between the wall and the panels, the level of sound insulation will be even higher. Especially, this property stands for 3D panels from gypsum. As a result, the level of comfort increases significantly. With the help of 3D panels you can create different effects, for example, visually expand the room or raise the ceiling. The advantage of 3D panels is the ability to combine with other types of cladding. Due to this, special plots, textures and color ranges are created. Gypsum. The material is relatively fragile. After installation, all joints are filled with a special putty. The surface of the panels can be painted in any color. If the humidity in the room is high, then it is not recommended to fasten the 3D panels to the walls. By itself, gypsum increases the heat and sound insulation properties of the wall.In addition, this material is not subject to burning, so they are often used when facing fireplaces. Metallic. In addition to decorative properties, such panels are characterized by high strength, reliability and safety. Such panels are predominantly made of aluminum and its alloys. The method of perforation is applied to them planned three-dimensional pattern. The billet is processed with a protective polymer film. So, you can select several positive properties of a similar finish: moisture resistance, corrosion resistance, fire safety. Installation of panels is carried out on a pre-made frame. Glass. In this case, glass is used with a thickness of 0.5 cm. The glass is quite strong. In the event of its destruction, it does not form sharp fragments. A similar structure of glass in a car. MDF. Products are highly moisture resistant, as the front side is covered with a special polymer film. It also contributes to long life. Plastic. The basis of polymeric materials. By their functions, such panels are similar to aluminum. Thanks to them, you can create different pictures, as well as select different colors. 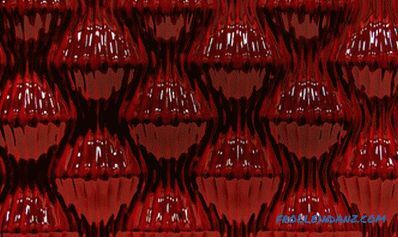 Plastic 3D panels are resistant to sudden temperature changes. By itself, the material is plastic, lightweight and durable. Moreover, plastic allows you to implement the most complex patterns. Wooden. These are the most expensive 3D panels. However, their high cost fully pays off their beautiful appearance. They are distinguished by an exquisite design and at the same time complex execution. At the same time, the panels are quite heavy. 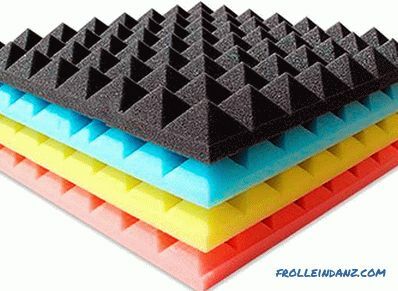 A special sound insulation material is used as acoustic panels. It is installed in apartments, cinemas, professional studios. 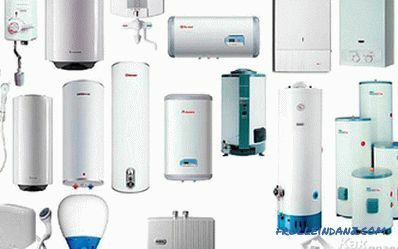 They are made of a wide variety of materials, each of which gives the product special technical properties. Variety of colors and styles. They are made of various materials, both from hard and soft. Very often they are based on MDF, fiberglass, plastic, wood, foam, etc. They can be mounted on the ceiling and walls. The surface of the panel is grooved and smooth. In professional studios are mainly used grooved. They contribute to the absorption of all unnecessary and extraneous noise. Such panels improve the recording quality. Glass will look great in the kitchen or bathroom. Wooden in the bedroom and living room. Plaster in a large hall. Also, when choosing, it is worth paying attention to the dimensions of the panels. Thin and long panels visually expand and lengthen the room. If the panels are large, they will look beautiful in large rooms. Select those products where the level is the lowest and is indicated by "1", for example, combustibility G1, toxicity T1, etc. In addition, pay attention to integrity packaging and panels without it. There should be no defects and all kinds of damage. The edges, corners and surface should not have any flaws. The protective coating should not be scratched and bloated. If one batch is bought, the color of all panels must match. These useful recommendations will help you make the choice that will make your room more beautiful and elegant. 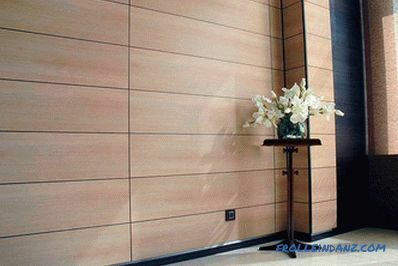 Having made a choice, starting from the quality, you will be able to purchase panels that will last more than one year.